I can never bring myself to finish open-world games. I've sunk hundreds of hours into the likes of Skyrim, The Witcher 3 and Far Cry 4 without completing their main stories, and I'm completely fine with that. For me, the thrill of marking a distant corner of the map, heading for it and seeing what happens is often far greater than going through the motions of a scripted story. But Kingdom Come: Deliverance feels different. Its story has hooked me in a way that few games manage, and despite its ever-growing list of enticing side-quests (there’s a runaway priest that I’ve been meaning to track down for the last 10 hours), I can’t pull myself away from the main storyline. In the game you play Henry, a simple blacksmith’s son. A slow beginning combined with solid voice acting means that when Henry’s parents are murdered before his eyes, marking the beginning of the real story, you really feel his pain. You want revenge as much as he does, and it just so happens that your vengeful desires align with the local nobles’ need to resist a warmonger. Most of the main quest involves those nobles asking you to do their bidding. In other games you might resent following orders, but everything about Kingdom Come: Deliverance reminds you that you're firmly on the bottom rung of society. Whether it’s the way the nobles look down their noses at you, or the fact that you can’t read, when a powerful Lord or a knight calls for your help, you share Henry’s sense of duty to oblige. As well as making it engaging and believable, the game also makes the main quest feel urgent by introducing deadlines. Early on, for example, you’re told that you must meet a bratty Lord at dawn the next morning for a hunt. In some games that NPC might wait in the same spot for eternity, but not in Kingdom Come. By giving you a specific meeting time the game sets your priorities for you. The main quest won’t progress without you, but being late for an appointment has narrative consequences. And some side quests do have a time limit: if you say you’ll go and heal someone and leave it too long, for example, they’ll die, which certainly encourages you to respect any time constraints you’re given. Unlike protagonists in other games, Henry doesn’t become an all-conquering warrior in a hurry, which means there's further incentive to stick to the main roads for a while. I don’t fancy wandering off into the countryside because I know that within 15 minutes some marauder with a massive axe will have me resembling an unfortunate Game of Thrones extra. I found this out the hard way about ten hours in when I took on a side quest to kill the leader of a nearby bandit camp. The group I found there were better equipped than me, and the guy in the shiniest armor killed me in one combo. He’s still on my ‘to-murder’ list for later. Kingdom Come's unique save system is another thing that helps focus that sense of danger. The game autosaves if you sleep in a bed you own, or at the start of certain missions, and you can manually save by drinking a certain potion. But that potion is very expensive, and gold is in short supply, so I rarely drink it. I can see why some people find the system frustrating, and it makes little sense from a narrative standpoint. But from a role-playing perspective, it’s the perfect way to ensure your choices have weight, and it means you’re less likely to risk your life on something that won’t advance the story. However, though the game has many means of encouraging me to stay with the core quest, the main reason I can’t stop playing through it is that its quests are so enjoyable – no two segments feel alike. At around eight hours in, I was sent to investigate a brutal killing in a nearby town, and found that I had to track down a guy known to be friendly with camps of charcoal burners dotted around the countryside. I tried one of these camps to the south of town. No luck. They pointed me to the north, explaining that the other camps are spread along a river running through a nearby forest. Rather than marking the individual camps, the game marked a large area, and had me do the legwork. I started at the far east of the river and worked west, eventually wandering across a huddle of tents. Again, they couldn't help, and pointed me further downstream. On the way I came across two cutthroats who were trying to track down the same man as me. I told them I knew nothing and bade them farewell, but I informed the next camp of charcoal burners that I’d killed the pair. That warmed them to me and yielded the location of my target (as it happens, I felt so guilty that I later ended up hunting down the cutthroats and killing them anyway). The next quest couldn’t have been more different. My search for another bandit brought me to a priest in a small village, and we drank cup after cup of wine at the local tavern, much to the disgust of the locals. I woke up in the early hours in a field of sheep, the priest baa-ing hysterically, before I blacked out again and stirred in a barn five minutes before the start of mass. The priest didn't have the stomach for his normal sermon, so I did it for him, relying on my charisma level (boosted by the fancy clothes I was wearing) to deliver a memorable speech despite my thumping head. Other quests range from invading a massive enemy encampment, to patrolling a town at night with the local guards, and I’m still having a lot of fun trying to guess what Kingdom Come: Deliverance will throw at me next. But that’s not to say it’s a perfect RPG by any means, and that’s largely because of its technical problems. You’ll come across minor issues everywhere, like characters clipping through walls and floors, or simply vanishing into thin air. Worse still, I’ve had multiple crashes to desktop, got stuck in infinite dialogue loops and – in one particularly bizarre sequence – completely lost the ability to walk forward. Combine that with the restrictive save system and you could regularly lose hours of progress in the main story. It’s frustrating to have to sit through the same cut-scenes when you know it’s not your fault. For that reason, you might want to hold off buying Deliverance until the developers patch the worst of the problems – the developers have promised bug patches in the next couple of weeks, though we can't be sure they'll solve all of the problems we've faced. But if you’re the kind of player who's willing to put up with these annoyances for now – and I, for one, am – then you’ll find Henry’s tale one of the most personal, varied, and entertaining gaming stories in years. When it comes to its main quest, Kingdom Come delivers. 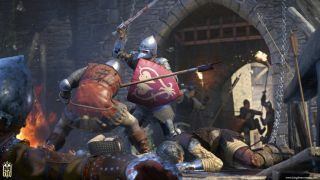 Kingdom Come: Deliverance is available to buy now for PlayStation 4, Xbox One and PC.